Imagine, if you will, a particularly long, exhausting, day. Work has been demanding and stressful. Perhaps you’ve struggled with a chronic health issue that has flared up again. There’s been word of a tragic event in your family. At the end of a day like that, what do you typically do to decompress? Do you prefer to be alone or with someone else? That’s the kind of day Jesus and the disciples have had. The have learned that John the Baptist has been beheaded. After a full day of teaching and healing and being surrounded by people, they have just witnessed the impossible feeding of a crowd of more than 5000 with just a few fish and loaves. It’s been a day of emotional highs and lows, and finally, it is time for a rest. Jesus sends his friends across the sea by boat while he seeks solitude and time to pray. The journey across the water should take these experienced sailors only a couple of hours, but the wind whips up, violently blowing them off course and away from their destination. The wind batters the boat—the word actually means something closer to “it torments the boat.” And it’s all happening at night. The disciples’ long day is followed by a long night of frustrating and ineffectual navigation. I doubt anyone is getting much sleep; even for experienced fishermen, this nighttime storm is frightening, and they’ve got their hands full just trying to keep the boat from capsizing. Sometime in the early morning, around 3:00 a.m., someone notices a shadow moving toward them on the water. As it gets closer, it becomes apparent that it is the figure of a human being—a human being walking on the water. This scene is also a reminder that seeing Jesus is often not as straightforward as we would like. In hindsight, we might wonder how a boat full of followers could have failed to know it was Jesus. Who else could it be? But Matthew’s story tells us that it takes eyes of faith to recognize when Jesus is around. Often, when we’re in the middle of the storm, tormented by waves of disappointment, betrayal, or doubt, we are no better at recognizing his presence than they were. What they were learning, and what we’re still learning, is that God visits us in unexpected times and places and circumstances. God reveals the divine presence and power and glory when and where we least expect it. In fact, God shows up in places—like walking on water—where only God can be, so it’s vital to be vigilant and alert for God. As soon as Jesus speaks his words of calm reassurance, Simon Peter—who else?—blurts out, “Lord, if it’s you, command me to come to you on the water,” and Jesus does. The word “come” is no sooner out of Jesus’ mouth than Peter jumps out of the boat and begins to walk towards Jesus, until that is, he takes his eyes off Jesus, looks around and down, notices the storm all over again, gets scared, and begins to sink. It’s easy to criticize Peter for taking his eyes off Jesus, losing his nerve and failing. But, let’s be careful. 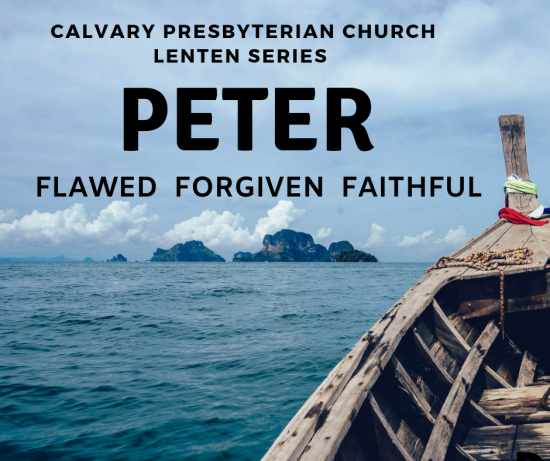 Peter is, after all, the only disciple who is willing to put everything on the line, to risk even his life, to try the impossible, to walk on the water towards Jesus. The boat is safe, secure and comfortable. On the other hand, the water is rough. The waves are high, the wind strong. There’s a storm out there, and if he leaves the boat, Peter has no idea what might happen. He doesn’t know if he will succeed or if he will fail, but one thing is for sure: if he doesn’t get out of the boat, there is a guaranteed certainty that nothing of significance will happen, because in the words of Presbyterian pastor and author John Ortberg, if you want to walk on water, you’ve got to get out of the boat. Matthew is sounding the alarm, telling us to pay attention, to remember that there is more to life than sitting in the safety of the boat. You were made for more than merely avoiding failure. You were made for the high adventure of following Jesus. So, let me ask you a very important question: what is your boat? Your boat is whatever represents safety and security to you apart from God. Your boat is whatever you are tempted to put your ultimate trust in, especially when life gets stormy. Your boat is whatever keeps you so comfortable that you don’t want to give it up even if it’s keeping you from joining Jesus on the waves. Your boat is whatever pulls you away from the high adventure of saying “yes” to the call of God. If you want to identify your boat, look at what you’re afraid of. Ask yourself, “what is it that most produces fear in me—especially when I think of leaving it behind, taking a risk, and stepping out in faith? For a lot of people their boat is their career. For others, it’s success or a relationship. Some people’s boat is secrecy. It might be your reputation or your independence. What is your boat? In what area of your life are you shrinking back from fully and courageously trusting God? Fear will tell you what your boat is. Leaving it will be one of the hardest things you ever do. But the choice is plain. You can either be a water-walker or you can be a boat potato. If you are going to take a leap of faith, there are four things water-walkers need to know. First, water-walkers expect problems. Peter experienced this when he “saw the wind.” In other words, reality sets in. There are setbacks, opposition, unexpected obstacles. You see the wind. You can expect that. The world is, after all, a pretty stormy place. Because of the wind, some people choose to never leave the boat, but you might as well know this now: there is no guarantee that life in the boat will be any safer, any less turbulent. Second, water -walkers accept fear as the price of growth. The fact is that the choice to grow is the choice to live with the constant recurrence of fear. The fear will never completely go away, because growth always involves a choice between risk and comfort. Which means that if you’re going to follow Jesus, you must renounce comfort as the ultimate value of your life. That’s a hard sell because we love our comfort, but comfort and water-walking are incompatible. Failure is not an event. It is a judgment about an event. We need to re-train ourselves to think of those events in our lives that don’t work out as we hoped or expected as times of learning and growth, not failure. What about Peter? Did he fail in this water-walking exercise? Well, in some ways, yes. He took his eyes off of where they should be—on Jesus—and saw the wind which filled him with fear instead of faith, and he sank. But, weren’t there eleven bigger failures sitting in the boat? They failed quietly. They failed privately. Their failure went unnoticed, unobserved, uncriticized. Only Peter knew the shame of public failure. But only Peter knew the glory of walking on the water, too. He alone knew what it was to attempt to do what he was not capable of doing on his own and feeling the euphoria of being empower by God to actually do it. Once you walk on the water, you never forget it—not for the rest of your life—and it shapes you in ways nothing else can. And Peter also knew the glory of being lifted by Jesus in a moment of desperate need. Peter knew, in a way the others could not, that when he sank, Jesus would be wholly adequate to save him. He had a shared moment, a shared connection, a shared trust in Jesus that none of the others had, even if it wasn’t perfect. They couldn’t know it because they didn’t even try. The worst failure is not to sink in the waves. It is to never get out of the boat. Finally, water-walkers learn to wait on the Lord. This event in Peter’s life is about risk but it is also about waiting. The disciples had to wait in the storm until the fourth watch of the night before Jesus came to them. Even then, it’s not until the very end of the passage that the disciples finally get what they were hoping for—relief from the storm. Why couldn’t Jesus have made the wind die down before Peter got out of the boat? Maybe because they—like us—needed to learn something about waiting. We have to wait on the Lord to receive power to walk on the water. We have to wait for the Lord to make the storm disappear. In many ways, “waiting on the Lord” is the hardest part of trusting. It is not the same as “waiting around.” It is putting yourself with utter vulnerability into Jesus’ hands. Jesus is still looking for people who will get out of the boat. It is, after all, the only way to real growth. It is the way true faith develops. It is part of discovering and obeying your call. It is the alternative to boredom and stagnation that cause people to wither and die. But, most of all, we get out of the boat because the water is where Jesus is. Thanks be to God. Amen.